Taxonom. Stud. 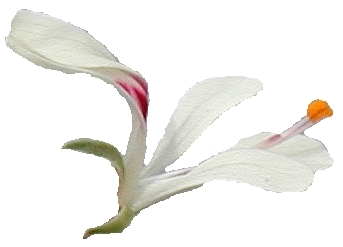 in Pelargonium, sect. Hoarea (Geraniaceae), Ph.D. Thesis, Univ. 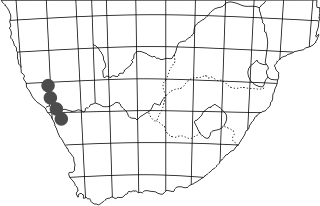 of Stellenbosch, 1994, p. 226. Lamina 15-40 mm long, broadly ovate. Simple, rarely trilobate or tripartite. Sparsely covered with short glandular hairs. 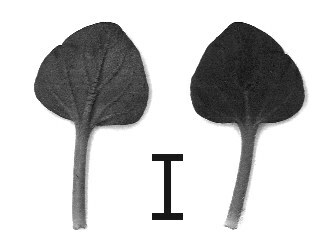 Petiole 1-4 cm, prostrate. Stipules subulate, adnate to petioles with free apices. Usually unbranched, with 7-27 erect flowers. Peduncle hirsute with stiff patent hairs and glandular hairs, pedicel ~0.5 mm. 5, lanceolate, posterior ~erect, other recurved. Hypanthium 10-25 mm. 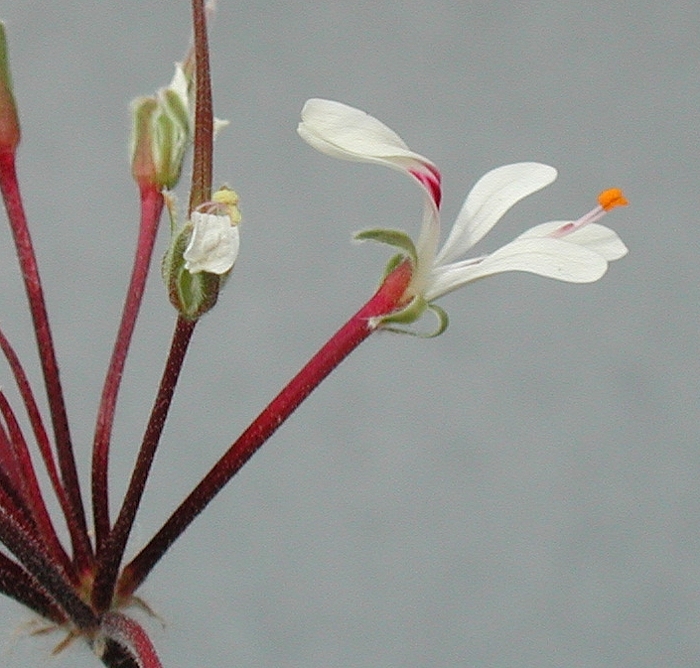 Petals cream to pale yellow, spathulate, posterior with red markings, 10-15 x 3.5-6 mm, anterior slightly smaller. 2 fertile, sometimes 3 or 4, never 5. Kodaspeak at the very N tip of the Richtersveld NP, N Cape Province. Why anyone would call this a mountain desert escapes me: there is life in every nook and cranny, and it is entirely feasible that some plants are hundreds of years old in these low-rainfall, harsh conditions. An excellent 4x4 is required on these roads, especially after some very wet recent summers. But remember that any off-road driving will destroy life that took more time to grow than a human life. Nature's succulent garden planting schemes are amazing. There is such abundance here it defies imagination - this simply must be seen to be believed. Plant spotting in the Richtersveld is rewarded by hospitality of the local people, an afternoon dive in the beutiful river Orange and a proper braai in the evening. And an occasional chat with another plant-spotter - very few other tourists venture here.